At many popular hiking areas, hikers are advised to stay on trails so as to minimize impact on the environment. In Hawaii, most often, the impact is reversed and the smart money is on the flora and land to deliver a blow to any hikers foolhardy enough to take off cross county. Hawaiian mauka (mountain) routes almost always follow a ridge, or head up a narrow stream valley, rather than following contours on traverses and switchbacks as they do in most mountain regions. Razorback ridges narrow down to a foot or so in places, with 1,000 foot drops to either side. The thick flora that buffets the routes disguises the hazard: you run the risk of stepping into a little turnout that turns out to be a tangles of greenery. Hawaiians have been walking the islands for many centuries. If you don't see a trail, there isn't one. Follow the trail, and if you lose it, turn back. Kealakekua Bay, south of Kona on the Big Island, serves up a buffet of tourist attractions: The Cook Monument snorkeling haven, Kealakekua State Park heiau (temple), and the sprawling grounds of Pu'uhonua o Honaunau National Historic Park, beside which is Two Step, one of the best snorkeling spots in the world. 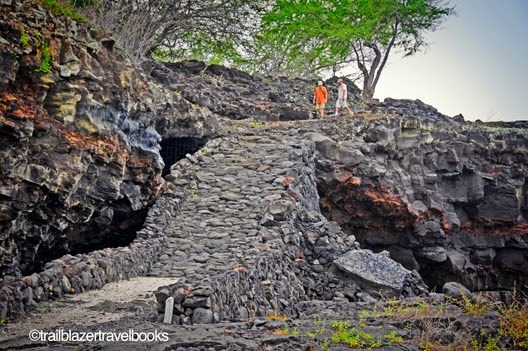 It's no wonder that many visitors miss Pu'uhonua Beach Park at the south end of the historic park. 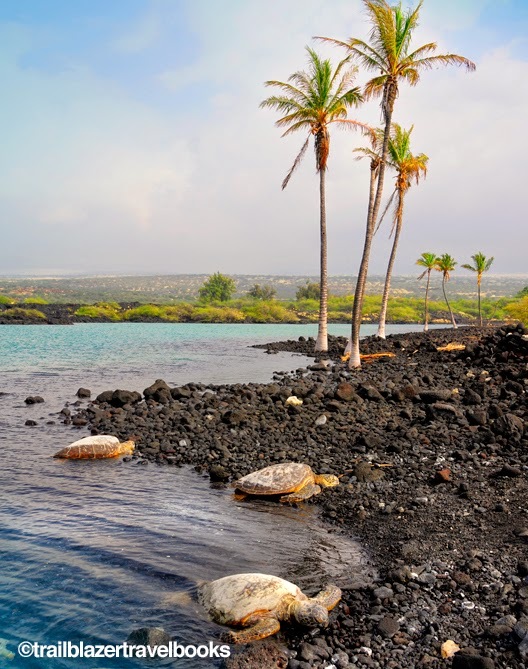 Here palm-shaded picnic tables are placed along a lava reef that has several excellent kid's swimming ponds, and the Ki'ilae Village Coastal Trail begins a historic route that can walk the legs off the most energetic of hikers. Much of the good stuff is within a mile of the trail head. The official trail (park boundary) ends after a mile or so, but the historic route continues for several miles to Ho'okena, a much-more-direct route than taking the modern paved highways. For trail directions consult your Hawaii Big Island Trailblazer and if you don't have one they're available for purchase on Amazon.com and BarnesandNoble.com. Every island has a north shore, but the “North Shore” as a place name can only be on Oahu, and there you will find Haleiwa, which is the undisputed world surfing capitol—although it is not clear who bestows such a title. Four surfing beaches on the professional world surfing tour are along the coast extending several miles east of Haleiwa: Haleiwa Ali’i, a lesser-known venue, is offshore the town; a couple miles down Kamehameha Highway is Waimea Bay (home to the Quiksilver in Memory of Eddie Aikau Big Wave Invitational); next up is Pipeline (or Banzai Pipeline, or just plain Pipe), right next to Ehukai Beach Park; and completing the run is Sunset Beach, home to huge wedges close to an easy-access big beach that inspired L.A. producer Dave Velzy to make those early 1960s surfer-Joe movies that in turn inspired the Beach Boys and a whole generation. 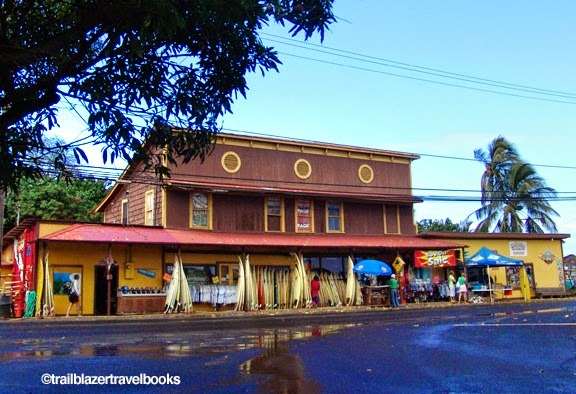 Haleiwa Town is an assemblage of wood-frame buildings, some quaint and some unremarkable, strung out along about a mile of a rural two-lane blacktop. You have to pick a few stopping points and poke around to find the eccentricities of the surfing culture that give the town its undeniable allure. 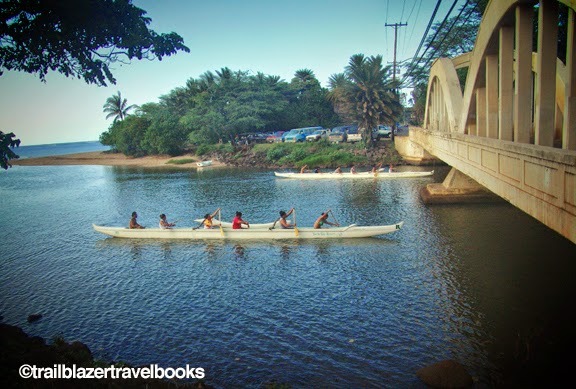 With a railway that extended back to Honolulu (which since has been wiped out by the sea), Haleiwa began as a sugar-growing town, with tourism on the fringes. Agriculture receded, but an endless supply of waves remained, becoming the town’s new economic product. When the swells are low, you can drive by these famous beaches without knowing it. But when the waves crank north of 18 feet (up to 50 feet!) then place is jumping, and, if you can find a place to park, ringside seats to see the best in the world are available for free. Blue Lagoon on the South Kohala Coast of the Big Island of Hawaii—a palm-fringed sapphire streak that is visible from a scenic turnout along a lava-desert highway—is the kind of place that has people staring wistfully through the partitions of office cubicles once they have returned to the Mainland. To get to this idyllic vision, most visitors take a monkey-see-monkey-do trailhead, close to the turnout, which swerves through a sun-scorched forest of stickery kiawe trees. Others take a state park road a half-mile away, which leads to the coast and provides a shorter trail along the coast. 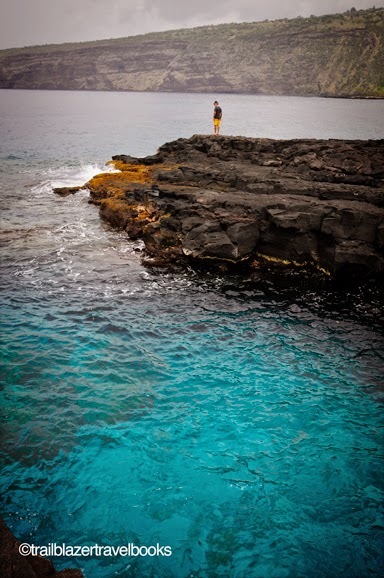 Officially named Wainanali’i, the five-acre inlet was created in 1810 by workers of King Kamehameha the Great, then a deep-sea fishpond with walls up to 8-feet high and 20-feet wide, and a shoreline of about 2 miles. What the king created Mauna Loa mostly destroyed during a massive eruption in 1859. In spite of its allure, the milky, colder waters of blue lagoon, which result from silt and freshwater intrusion, are not the best for swimming. Even adjacent Kiholo Black Sand Beach is better. See pages 64 to 66 of Hawaii the Big Island Trailblazer for more details. 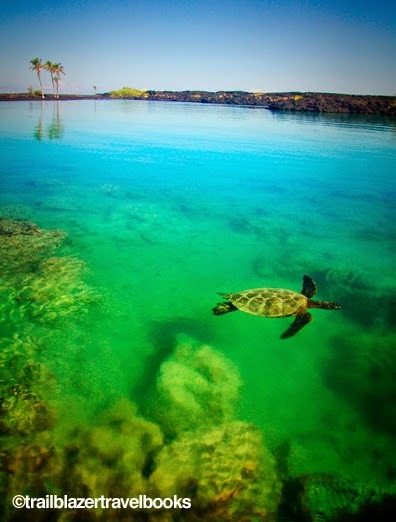 Send us a brief e-mail saying why you want to go to Maui and what you hope to get out of the trip. 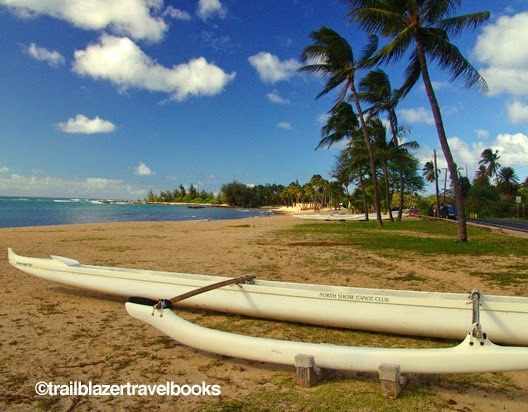 We'll send out a free copy of Maui Trailblazer: where to hike, snorkel, surf, drive to the FIVE people who submit the most compelling and creative responses. 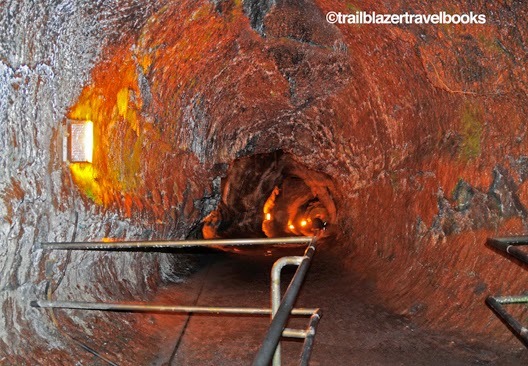 Arrive early to avoid the tour buses at the Thurston Lava Tube, a.k.a. Nahuku, an attraction that delivers the scenic goods on the rim of Kilauea Caldera in Hawaii Volcanoes National Park. The wide path begins down a bird-rich, ohia-and-tree-fern forest, a lushly set songfest you would not expect to experience so close to the barren lava of an active volcano. The tube, lit by lights, has a dripping ceiling about 15 feet high, like a subway tunnel sans train. Lava tubes are formed when the surface of fast moving lava cools and hardens. The hot lava continues to flow underneath until the source ceases, and the tube drains. This underground passage is nearly a quarter mile long—with an option to continue another 1,000 feet if you have your own flashlight and don't get creeped out. Full directions on how to get there and several crater hikes in the vicinity can be found in the Hawaii the Big Island Trailblazer guidebook. Log onto CheapFlights.com, grab a deal and fly to Oahu. Once you're there be sure to catch the after dark haps on Waikiki. The Waikiki Aquarium's annual summer concert series, Ke Kani O Ke Kai (sound of the ocean) is within walking distance of the hotel strip. Doors open at 5:30 p.m. and combine music with nighttime tours of the aquarium. The next performance is July 15 featuring Willie K. followed by Amy Hanaialii on July 29 and closing with Hookena on August 12. Bring a beach towel, beach mat, or mini folding chair and enjoy the music. Tickets are available online. Food booths run by local restaurants are on the premises should you want a Hawaiian style dinner. Every Tuesday, Thursday, Saturday and Sunday (weather permitting) be sure to catch the free Waikiki Hula Show at the Kuhio Beach Hula Mound from 6 to 7 p.m. It opens with traditional blowing of the conch shell, seating is on the grass and arriving early is advised. By the time the tiki lamps are lit and the sun has melted into an amber Waikiki sunset you'll be swaying along with the palms with other aloha infused visitors who are ready to buzz the bars, restaurants and clubs to fill out the night. Mahalo to the City & County of Honolulu, the Hawaii Tourism Authority and Waikiki Improvement Association for their sponsorship of this weekly event.